A daily, Bible-based perspective of hope, encouragement and exhortation. Mobile users: Visit Daily Encouragement on your mobile browser, hit "Add to home screen" or "Add page shortcut." This creates an instant Daily Encouragement App! A new message is updated each weekday usually by Noon Eastern Time (USA). Message summary: The message that we especially celebrate on Easter is a daily, life-impacting truth. He always lives. Listen to our message on your audio player. "Therefore He is able to save completely those who come to God through Him, because He always lives to intercede for them" (Hebrews 7:25). Sunday morning I was sitting in church waiting for the service to begin. We had a powerful instrumental prelude with the orchestra playing "Easter Song", made popular by the family group "The Second Chapter Of Acts" way back when we were in college. (video link below) It was cutting edge contemporary music at that time, but I suppose now it would be considered "old-fashioned", especially to younger ears. But the message has not changed! They're singing, "Christ is risen from the dead!" I looked up at Brooksyne in the choir and waved as I always do (much to her embarrassment). I was preparing to worship the risen Christ along with people not only in the church we attend but with people all around the world in such a wide variety of settings; from large churches to home groups, people from every tribe, nation, race and tongue declaring, "Jesus Christ is Risen". Of course due to the various time zones many had already gathered, including people on the island nation of Sri Lanka. Like many we have our phones set to provide notifications. Just as the service began I received the news through a notification about the Easter Day terrorist attacks in Sri Lanka. What a stunning contrast in scenes and experiences based upon photos of the carnage. A reminder of how I may take my relatively easy life for granted. The daily Scripture text has rightly brought hope and encouragement to so many through the ages of the Church. Consider the power of each individual phrase, reading them slowly and pondering their rich meanings. "those who come to God"
I left out the single phrase I want to reflect on this morning. "Because He always lives". The message that we especially celebrate on Easter is a daily, life-impacting truth. He always lives. Today some of you are in a valley, and the shadow that falls over you is like a darkness that "veils His lovely face". We certainly consider the people in Sri Lanka. But due to the nature of our work as chaplains we always have people on our hearts going through tough times. The trouble overshadows You while the Savior may seem far away. 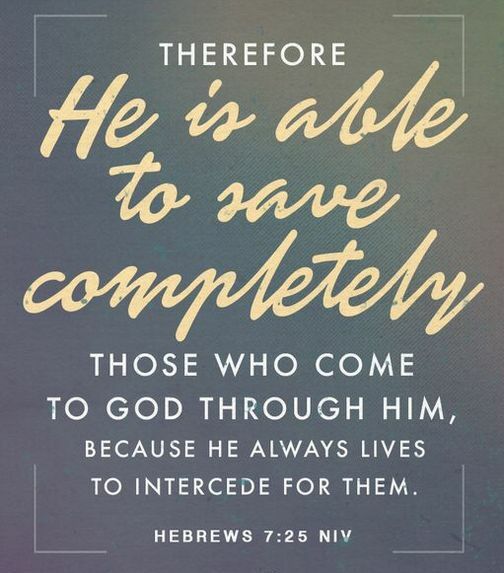 Remember this important Biblical truth today: He always lives and He is ever interceding for you. In His wondrous and mysterious providence God ordains the valley for our ultimate good. It is in the valley that He restores our soul and gives us needed perspective. In 2 Corinthians 1:9 Paul writes that he suffered hardships even to the point of feeling the sentence of death. "But this happened that we might not rely on ourselves but on God, who raises the dead." God ultimately, in one way or another and not always in the ways we expect, delivers us from our troubles and raises our hopes above our present circumstances. Others of you are on a mountain of temporary success and well being. Your health is good, the children are obeying, and the job seems steady. We certainly rejoice and give thanks for these peaceful periods in our lives. But remember, it's only temporary and don't be lulled into complacency and self-sufficiency like the man God called a fool. Jesus always lives and He's got a program much larger and better coming. Daily prayer: Father, no one who comes to You through Jesus goes away unable to find reconciliation with You, for You save completely and to the uttermost. Because Your Son lives and intercedes for us we have renewed hope daily for the circumstances of our lives and for the people that are dear to our hearts. We lift up the families and friends of Christian worshipers who were slaughtered by Islamic terrorists in Sri Lanka on Easter Sunday. We also pray for those who survived but are dealing with injuries, from minor to life altering, some barely clinging to life. Though the circumstances are so very dreadful, we know that Your redemptive and healing power will result in people giving testimony of Your faithfulness even in the midst of such horror. May people be saved and the enemy be defeated, to the dismay of those who wish harm upon followers of Christ. Fill our hearts anew with hope, encouragement and endurance as we stand upon Your Word and fully trust You to guide our lives this day, in the good times and in the bad. Amen. 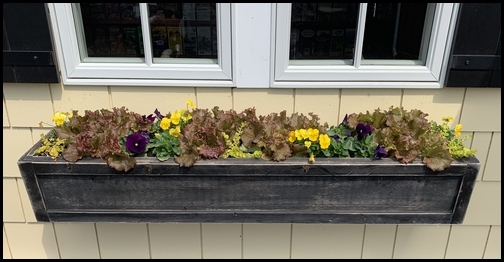 We always enjoy sharing photos of sights we see along the way as we drive through rural Lancaster County. 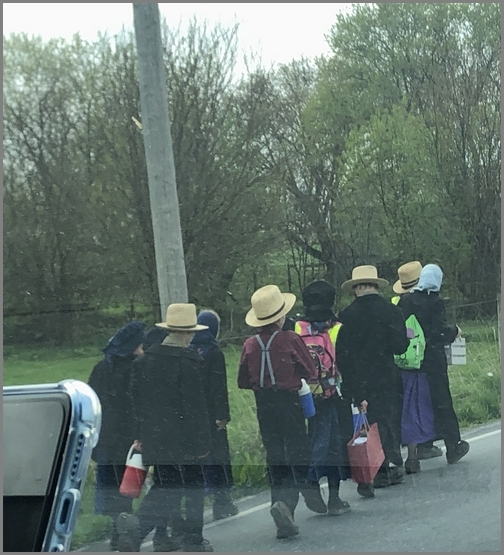 We passed these children walking home, a little tired from a long day at school, on a rural road south of New Holland. 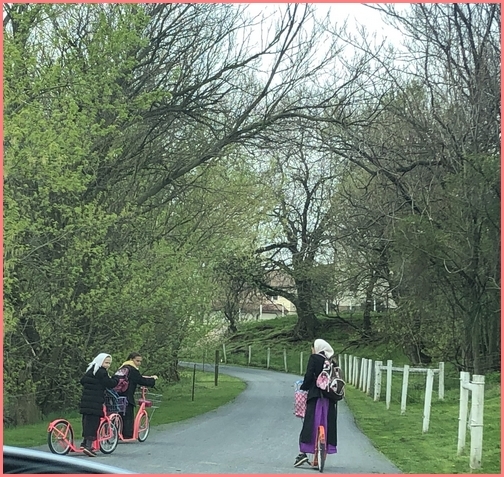 These girls were heading down their farm lane on their brightly colored scooters. 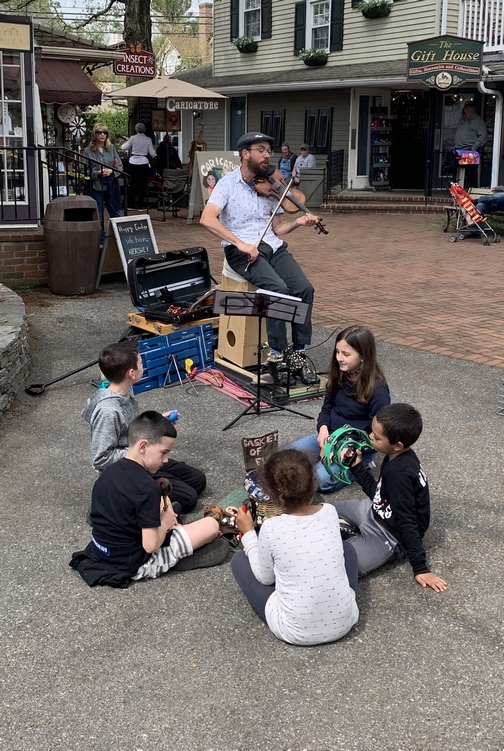 The street musician at Kitchen Kettle Village along with his guest accompanists. Banjo Jimmy, who played for many years in the village, died last year. Watch this nice video tribute. 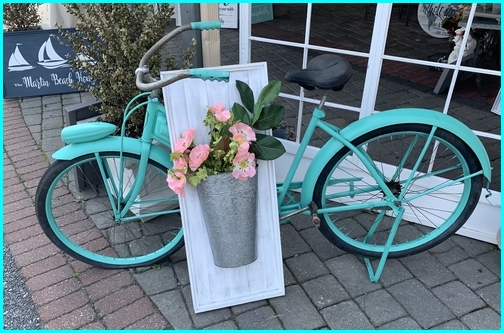 This colorfully painted bike was in front of a shop at the Kitchen Kettle Village. The owner asked us if this was the kind of bike we rode when we were children. Actually, except for the kickstand, it does look similar to my first bike, fenders and all! My dad bought it new for me at the Western Auto Store on Main Street in Belton, Missouri about 1963. "Exalted Over All" Video Calvary Church Choir and Orchestra Brooksyne's note: Our Easter octavo presents the important truth that God is exalted over all; His name is higher, stronger and is to be exalted above all names. "We want to encourage you daily in your walk with Christ!" We realize there are many fine ministries and causes requesting support but if the Lord would lead you we surely need and appreciate the financial support from our readers and listeners. Our ministry labor is comprised of approximately half our time to Daily Encouragement and the other half to our chaplaincy ministry to companies for which we receive compensation. Each of these ministries essentially is the same as a part-time job (20+ hours weekly) for each of us. 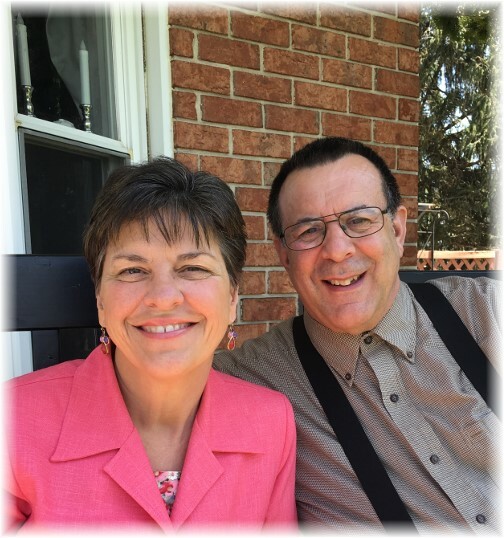 Our goal for many years is that each would provide half of our ministry expenses and income. If you would consider making a donation to our ministry see here for more information. Please Note: We also provide this easy option due to the convenience, for international supporters, and for those who may not be concerned regarding receiving an official tax deductible receipt. Click here to send an offering using PayPal. This will open to a page that states "Brooksyne Weber"
Permissions: Please feel free to pass on, reproduce and distribute any material on Daily Encouragement Net, in part or in whole, in any format, provided that you do not alter the wording in any way or charge a fee beyond the cost of reproduction. It is our desire to spread this material, not protect or restrict it. We do request that you keep the contact, copyright and subscription information intact. Scripture references are from The Holy Bible: New International Version. © 1984 by International Bible Society; NEW AMERICAN STANDARD BIBLE®, Copyright © 1995 by The Lockman Foundation, New King James Version (NKJV) Copyright © 1982 by Thomas Nelson, Inc. and the King James Version. Personal Mission Statement: "I am created by God to bring Him glory. Through God's Son Jesus Christ I have been redeemed and make it my life's goal to please the Lord. My mission in life is to honor God through my faith and obedience and prepare myself and all whom I may influence for eternity." "Living securely today anchored in God's solid foundation"